BELTON, TX — A monument is in its fundraising stages to honor those who lost their lives in the Gulf War. The National Desert Storm War Memorial is set to be unveiled in Washington D.C. in 2021, but before that can happen, the National Desert Storm Memorial Association has to raise $40 million. 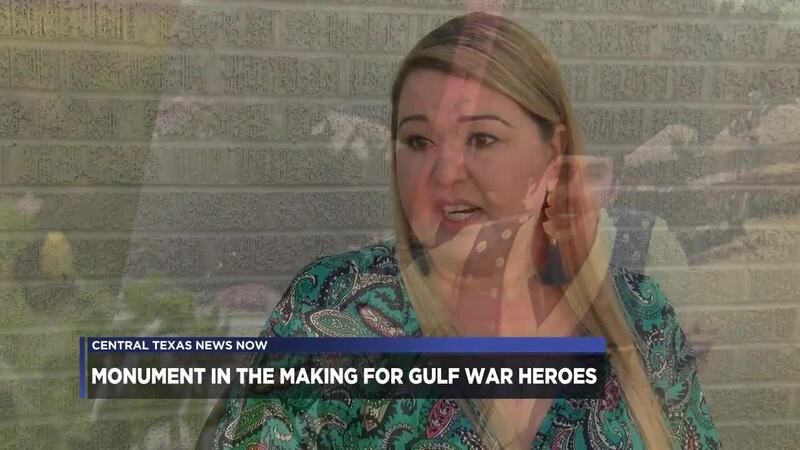 With such a big price tag, the Belton community is coming together to do what they can to help, and it's all under the leadership of Adriane Hodges who lost her father in the war. "My dad explained it to me like you would an 8 year old. He said, 'You know there is this really bad guy Saddam Hussein and he has invaded a country called Kuwait and there are little girls just like you who aren't getting to live their lives, and have their families, and their dad and their freedom and good people have to go and stop people like that,'" Hodges said. "I just thought well yeah, that's what my dad does. He goes and he has his helicopter and he fights the bad guys and you kind of think alright he will go do his job and then he will come back." Jonathan Ross Edwards, also known as Captain Jack, was overseas for only a few months before his family was notified that he died. "It's hard, you know you just don't expect somebody to not come back, but that's the reality of war is people die and he unfortunately did," Hodges added. The 34-year-old marine was killed in action when his helicopter crashed. "The oil fields were burning, it degraded the machines and created a mechanical failure and the rotor inverted and flipped the helicopter upside down," Hodges said. On Feb. 15, just a few days after his death, Cpt. Jack became the first officer killed during the Gulf War to be buried at the Arlington National Cemetery. "It was pretty intense because there were like bleachers of press set up at his funeral and it was just the saddest day," Hodges said. But, Hodges said among the memories of grief, come those of support from the nation and even a former president. "George and Barbara Bush came to our house and, you know had a parade for my dad personally go involved and we got bags of mail, I mean sacks of mail to our house just from kind people," Hodges said. It's because of Hodges that the Belton community is helping raise money for the memorial. To do that, as a part of the city's 100th annual Fourth of July celebration, there will be a Patriot Fest to honor veterans, and it will serve as a fundraiser. The event is set for July 6 and 100 percent of the proceeds will be donated to the National Desert Storm Memorial Association. As part of the event, Bold Republic Brewing Company, which Adriane is part-owner of, is set to release its Cpt. Jack beer. "We really want to give a hat tip to Adriane's father, you know I never got to meet him so that's my loss, but I sure would hope he would approve and really enjoy this product that we made for him and again, he was a hero and hopefully this beer would be fit for a hero," Adriane's husband Patrick Hodges said. The recipe for the beer will be available to breweries around the world, who will all donate profits to the National Desert Storm Memorial Association. "The fact that people care and still remember, it reminds me of when my dad died, you know we got letters from perfect strangers saying we would love to help your family what can we do," Hodges said.